Firstly, I have to clarify that this recipe is not a true hummus. Personally, I don’t really love hummus. I mean, it can be good, but there are a lot of bad ones out there – at restaurants and pre-packaged at stores like Central Market and Whole Foods. Some are too lemony, some are tasteless, and sometimes the hummus is mealy. I prefer a softer, smoother texture that I get from using white beans instead of garbanzos. So this recipe is actually a white bean dip recipe made with beets. There is no lemon and no tahini and no garbanzos. It’s just sometimes easier to say or write hummus, rather than white bean dip! I recently made beet ravioli again, and this time I used canned whole beets to see if there was a difference in the beet filling, as compared to using roasted beets. As it turns out, that there wasn’t any difference. With all of the many different variation of white bean dip I’ve made over the years, I’ve never included beets, and I decided to change that immediately! Drain the white beans well in a colander. I give mine a rinse as well. Place the beans in the jar of a food processor. Add the beets*, garlic, cumin, and salt. Process, pouring in a little olive oil at a time until the mixture is fairly smooth. Scrape down, and process until the bean dip is smooth. Serve immediately, with pita triangles or crackers. If desired, drizzle a little olive oil on top of the dip. A little crumbled feta cheese on top is also tasty! * You don’t have to squeeze the liquid from cooked beets for this recipe, but you may not need as much olive oil if you don’t. Just add the oil slowly, until the proper consistency is reached. note: The next time I make this, which I will, I will use 1/3 of a cup of beets, instead of the 1/4 cup I used. The beet flavor is surprisingly a bit subdued. I could used less garlic and cumin, but I really was after that beet, garlic, and cumin flavor combo! If you’re interested in my other white bean dip recipes on which I’ve posted, check out white bean dip, and another white bean dip! Tomorrow my post is a tomato tart, based on a recipe by Giuliano Bugialli. Because my blog is written primarily for people who don’t do a lot of cooking but want to, I thought I’d first go over making a pie crust. A lot of people would rather purchase pre-made pie crusts than try making one at home. And if you must, that’s okay. But if you try this one pie crust one time, you will see how much better it tastes, how easy it is, and how much less expensive it is as well. And that’s minus whatever preservatives might be in the pre-fab crusts . 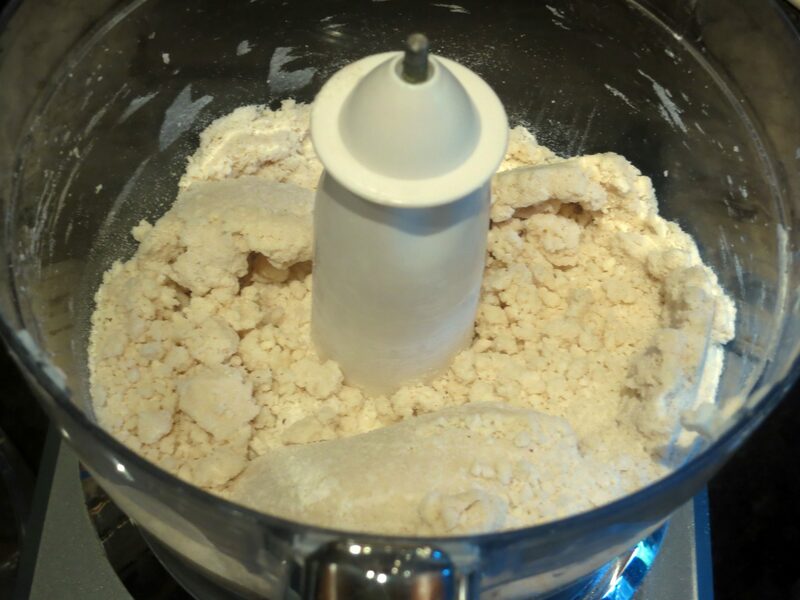 I’m going to use a food processor to show how I make pie crust. Even Julia Child, the grand dame of French cooking and old-school chef, began using a food processor in her later years. It might have even been Martha Stewart who showed her how well it worked, without compromising the quality of the dough, during one of her cooking shows. Nonetheless, if Julia Child can use one, so can I. There are just a few rules that are important. But they are simple rules. First, have everything on hand. That would include your food processor, flour, cold butter, shortening, a pourable container full of icy water, and a large piece of plastic wrap. Here’s a recipe. Sprinkle a little bit of flour onto the piece of plastic wrap and set aside. Pulse the food processor’s blades until the mixture looks like crumbs. Have the water in one hand, and use your other hand to run the food processor. Start up the food processor on the continuous mode and begin slowly pouring the water into the floury mixture. A slow drizzle will work well. If you over pour the water, you will get globs of wet flour, so it’s best to go slowly if you’re concerned about this. Normally, over processing the dough will create a stiffer dough, which isn’t good, but this can be worked out later when you’re making your pie crust. So just make sure there’s a constant drizzle. 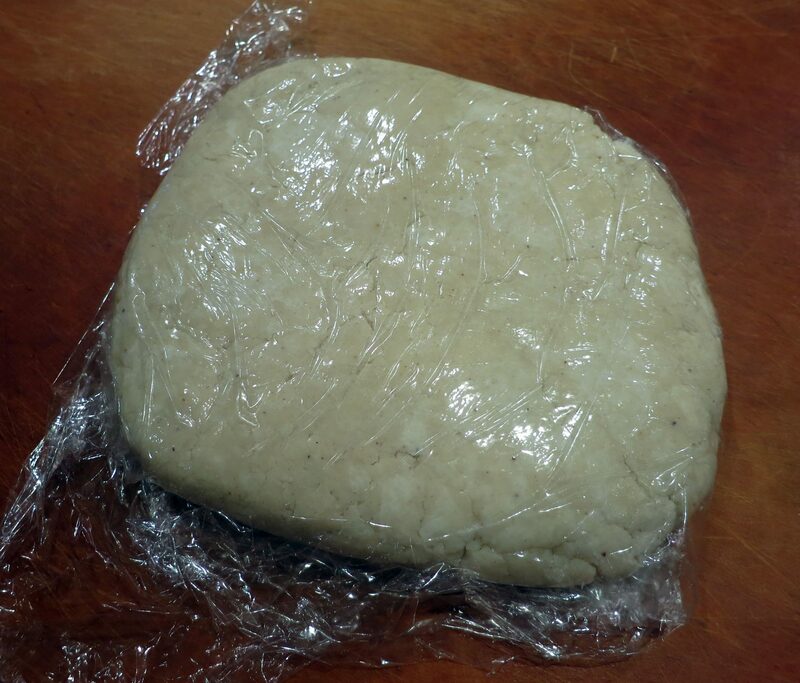 At one point, stop and look at your dough. 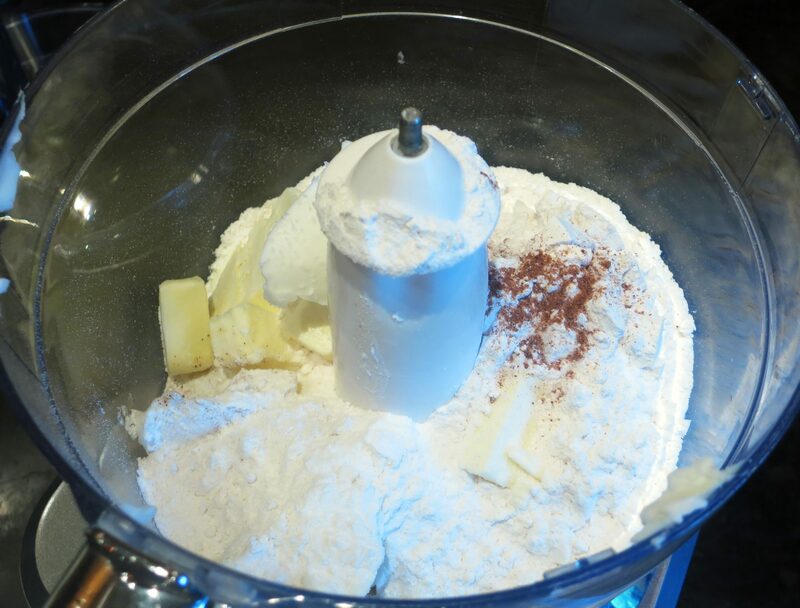 If you see some parts that look like dough, but other parts are dry and floury, you definitely need to add more water. 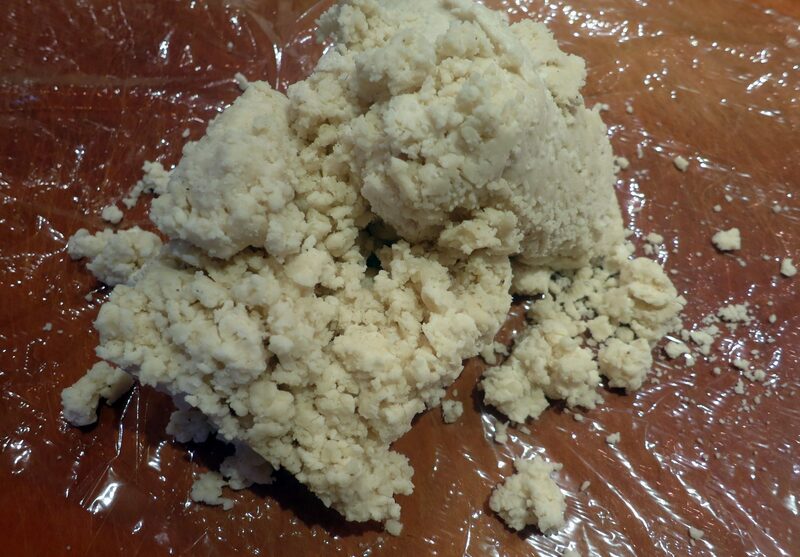 One your giant blog of dough has formed, remove it from the food processor jar and dump it onto your piece of plastic wrap. Sprinkle a little flour over the blob, and then working with the plastic wrap, place your hands underneath and mold the dough into a firm, flattened disc. No kneading is necessary. Fold the plastic wrap over the disc and refrigerate it for a couple of hours, or overnight. When you are ready to use the dough for a pie crust, have your pie pan ready, some flour handy, and your rolling pin available. First, unwrap the disc and place it on your surface, with a little flour sprinkled on top. 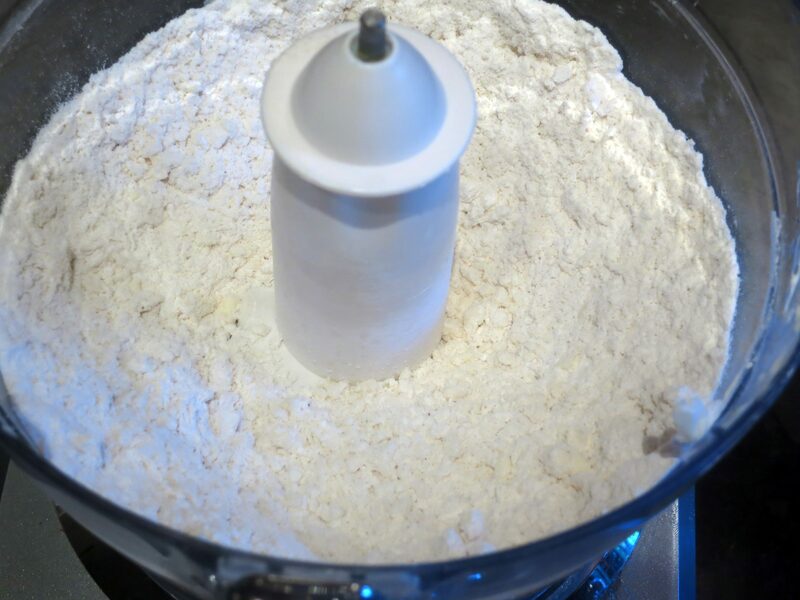 Try to use as little flour as possible, because believe it or not, the flour can add up and create a dry crust. Then take your rolling pin and beat the cold dough with it. This will loosen the dough a bit, and allow for better rolling**. Then start rolling out the pie crust. This recipe will easily make a 9″ or 10″ pie crust, so you should have plenty. Don’t worry if you aren’t making a complete circle – that’s nearly impossible. Roll it out about 1/4″ thick – too thick isn’t good, and too thin will cause tearing. Any tears you do get can be sealed, so don’t worry about those, either. As you roll, carefully lift the crust and turn it over, so you can thoroughly but lightly dust the crust with flour, if necessary. Every wet spot on the crust can potentially stick to the pie pan, and you don’t want that. 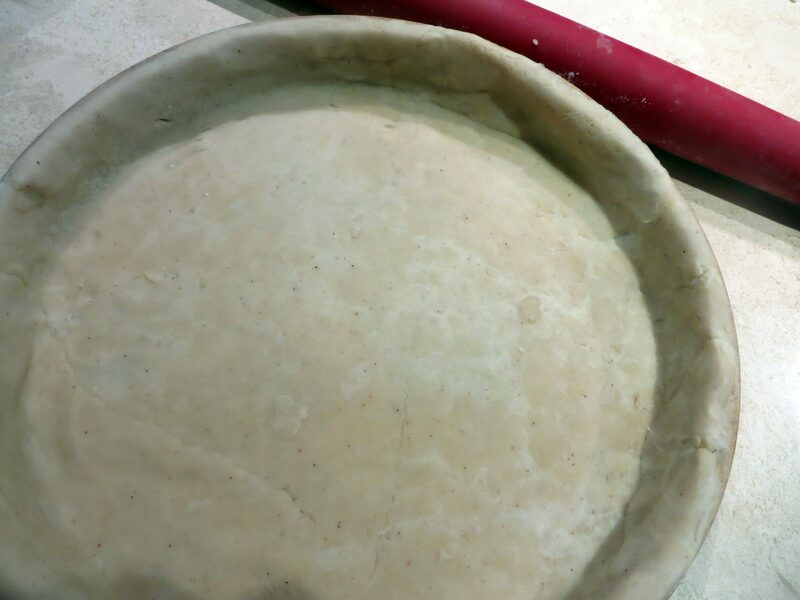 When it is larger than the diameter of your pie pan and the correct thickness, fold the crust over the rolling pin and gently place the dough over the pie pan. Make sure it is centered, and then gradually press down on the bottom of the pie crust. After you do that, work your way around the sides and press the crust into place. If you have long fingernails, use your knuckles. There are many ways to make a fancy pie crust edging, but I’m going to make mine absolutely plain, because it’s not necessary to be fancy. Simply take your rolling pin and roll it over the top of your pie pan, and all the excess dough flaps will essentially get cut off. There! You now have a pie crust. As you can see, mine isn’t perfect. I was working too quickly, which I often do for some unknown reason, and the dough tore, but it’s seriously no big deal unless you’re entering a pie competition. The dough will seal as it cooks. But if you are concerned, dip your finger into water and mush the tear together to smooth it out. I’m only talking a drop of water. If you’re making a pie that requires you to fill it immediately and bake, then make sure you also turned on your oven before you began working with the pie crust. The best advice I can give with pie crusts, however, is that they be refrigerated after they’re placed in the pie pan. If the crust dough is warmish, then as soon as they’re in the oven, the fat will ooze out of them, and the results will not be pleasant. It will be a soggy mess. Trust me on this, because I was once in a hurry to bake some puff pastry, and didn’t take the time to put it back in the refrigerator for a mere 30 minutes….. I remember this hard lesson learned from many years ago! Now that you’ve made a pie crust, think of all the fun things that you can add to it – like dried herbs, or white pepper, or cayenne or chili powder…. Then, you can also add finely grated cheeses to it… Or finely chopped nuts….. Oh, it gets even more fun! If you happen to have some dough left over, you can easily make a couple of pie pockets, with savory or sweet fillings, or top a stew with the crust for a prettier presentation! Don’t let it go to waste! * Supposedly, the best fat mixture for pie crust is a 50-50 mixture of butter and shortening. The butter adds flavor, and the shortening provides flakiness. You could certainly use either or if you prefer.